Constant Hosting Review 2019: Is Constant Hosting a Good Hosting? Constant Hosting is solid if you're looking for a basic customizable server. They have some of the best uptime guarantees in the business. They have both managed and unmanaged dedicated server setups. Constant Hosting is a New Jersey-based company that offers a wide variety of internet services including dedicated servers. Their servers come with some fantastic uptime guarantees along with quick hardware replacement 24/7. Server pricing is a bit deceptive as they only offer basic setups and you’ll have to pay up to get a usable server. Constant Hosting offers redundant data center facilities in areas where they can connect to major backbone internet providers to provide excellent speeds and uptime. Their primary data center in New Jersey has technicians on site as well as an extensive parts inventory that allows fast hardware replacement and installation. If you know how to manage a server, you won’t have any problems using this product. This is for advanced users only, so beginners need to find a provider that offers shared hosting. 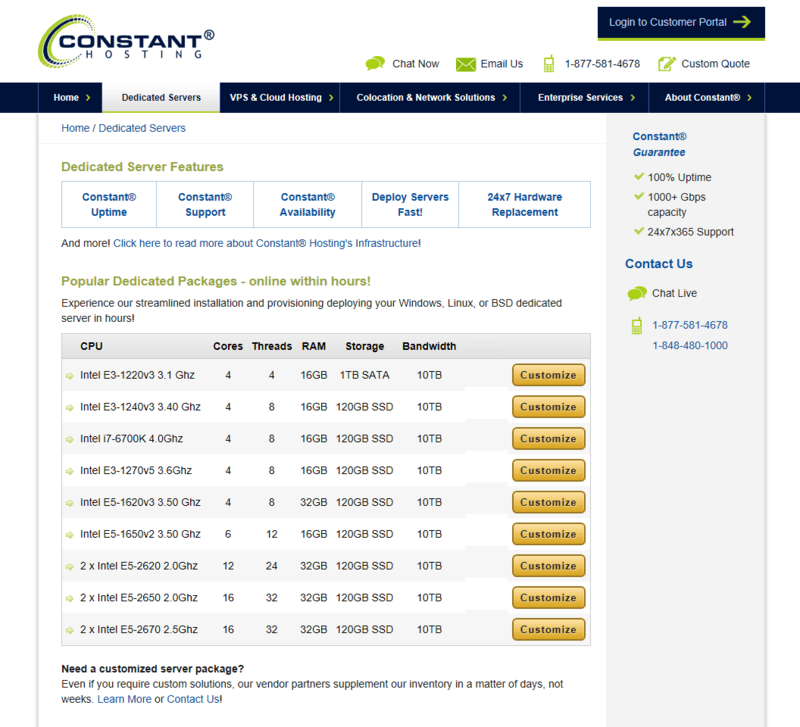 Constant Hosting offers nine basic setups all offering 10TB of bandwidth. Here’s a quick breakdown of the basic configurations. For the base configuration, Constant Hosting is cheaper than your standard provider. That’s because these servers provide only the basic features, and you’ll pay up once you start customizing your server. One thing I like about their service is that they offer month-to-month contracts. All plans come with a 14-day cancellation policy. You’ll notice that Constant Hosting offers VPS services, but pay close attention. They are simply a reseller for VULTR and do not provide their own VPS packages. Constant Hosting offers solid support that includes 24/7 live chat, toll-free phone support, email support, and online ticketing support. Note that their support only covers issues such as rebooting a server and emergency hardware replacement. If you’re looking for support on operating systems, mail servers, databases, or more, you’ll have to purchase a managed support plan. Constant Hosting is good for those looking for cheap barebones dedicated servers. You won’t find many providers with even similar uptime guarantees. As long as you’re OK with paying up to get a proper server, you shouldn’t have a problem with this provider. Wondering how Constant Hosting stacks up against other Web Hosting companies? Enter any other Web Hosting company and we will give you a side-by-side comparison.